I’ve said it before — open clusters don’t get a lot of attention. 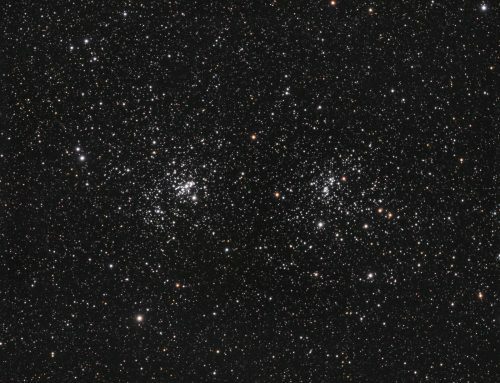 Apart from a few splashy ones like the double Cluster, the Seven Sisters, etc., most deep sky imagers ignore open clusters in favour of more subtle views, like galaxies and nebulae. But when the moon is full, the best kind of target other than nebulae in Ha are bright open clusters. 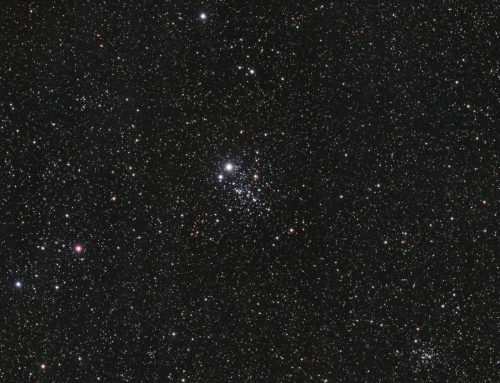 This shot shows NGC7789, which some people rate as the nicest of Cassiopeia’s many open clusters. This is one of several objects discovered by Carolyn Herschel and is sometimes called the White Rose Cluster or Carolyn’s Rose Cluster. It is about 8,000 light years away, and in our home galaxy, the Milky Way. 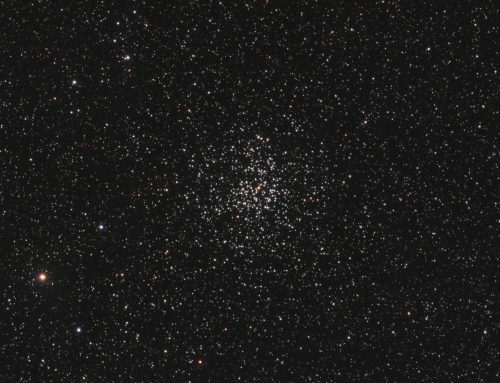 It is an old cluster, at 1.6 billion years. A hint to its age is the many reddish stars visible in this shot. These massive stars have used up most of their fuel and have now cooled and expanded, becoming red giants. The other stars, born around the same time as the red giants, started out with less mass, and are still on the “main sequence”. They, too will eventually cool and redden. SBIG STL-11000M camera, Baader RGB filters, 10″ f/6.8 ASA astrograph, MI-250 mount. Guided with external SBIG guider and 500mm f.l. guide scope. Acquisition using Maxim-DL. Focused with FocusMax. Shot from my SkyShed in Guelph, Ontario. Moderate moonlight, average transparency and seeing. Calibration in MaximDL. Registration, integration and processing in PixInsight. Data was acquired in August 2012 and re-processed in 2016. 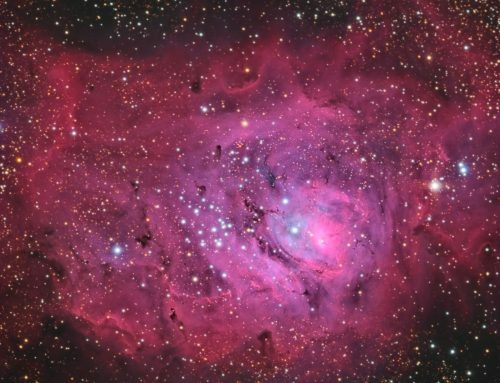 Creation and cleanup: R, G and B masters were combined with ChannelCombination, and the resulting RGB image was cropped and processed with DBE, followed by BackgroundNeutralization and ColorCalibration. Creation and cleanup: The cropped R,G, and B masters were combined using ImageIntegration tool (average, additive with scaling, noise evaluation, iterative K-sigma / biweight midvariance, no pixel rejection) to create the SynthL channel. DBE was applied. Deconvolution: A copy of SynthL was stretched to use as a deconvolution mask. A star mask was made from unstretched SynthL to use as a local deringing support. Deconvolution was applied (100 iterations, regularized Richardson-Lucy, external PSF made using DynamicPSF tool with about 20 stars; local deringing at 70% and global dark deringing at 0.03). Contrast, brightness and saturation were increased slightly with the Curves tool.